The family dogs, Madeline and Brinkley, relax in the backyard, which was landscaped by Naud Burnett of Kevin Clark | Naud Burnett. Architect Christy Blumenfeld and her husband, Adam, remodeled a 1940s ranch-style house and its grounds into a cozy family home. Christy Blumenfeld and her husband, Adam, had been looking for the perfect house for a while. So long, in fact, that when Christy found her dream home and called Adam to tell him, he had forgotten they were looking. “When I drove up, I knew immediately that it was the one. I called my husband at work, and I said, ‘I found it.’ He said, ‘Found what?’ she fondly recalls. “I said ‘I found the house.’” This all before Christy had set foot inside. “I knew I could fix the house, but what I was looking for was a beautiful piece of property.” That day, the couple put an offer on the 1940s Greek Revival–style ranch that sits on just over two acres. In the entry, a table from Allan Knight sits on a cowhide Kyle Bunting rug. The large vessel is from The Loveliest. The chandelier, which is original to the home, was edited by John Gregory Studios. The grasscloth wallcovering is Phillip Jeffries. In the dining room, Christy mixes new pieces with antiques, such as an armoire from France and an Oushak rug from Brittany Crow. An Emanuel Morez chandelier accents the custom table by Alberto Greca and chairs by David Cuellar. A bench from Big Mango Trading Company pairs with a piece by Paul Manes from Cris Worley Fine Arts. The night after they purchased the home, Christy, an architect and founder of Blume Architecture, and Adam, CEO of Varsity Brands, sketched the house renovations on a napkin. 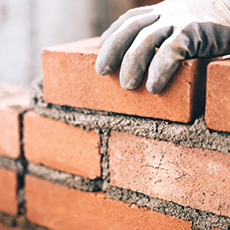 Shortly after, they started the eight-month remodel, which included taking the home down to the studs, apart from the dining and living rooms. Christy acted as the contractor and Adam as copilot: His idea was to add a 60-foot porch to the back of the house that allowed them to build a second-floor playroom, exercise room, and bedroom/bathroom. All in all, they added about 3,000 square feet, which also included a master retreat and sitting area that has a beautiful view of the backyard. But that was only phase one. Over the course of 13 years, the couple continued to update the home and grounds, choosing a new project each year. One of those phases was calling in interior designer Tracy Hardenburg to refresh the interiors. Adam wanted a more contemporary feel to the house, but Christy sought to keep the timeless nature of the home while remaining warm and cozy. When Tracy walked in, she immediately sensed that the home needed some updated furniture, along with bolder color choices. “I bought a really modern Kyle Bunting rug for the entry hall. [Tracy] said, ‘You can’t keep this modern rug with this old Ralph Lauren wallpaper,’’’ Christy says. Tracy talked a hesitant Christy into choosing a bright blue Phillip Jeffries grasscloth wallcovering that envelops the entry. In the den, swinging chairs by Kettal from Smink and a metal drum table from Ceylon et Cie offer up a place to relax with a view. 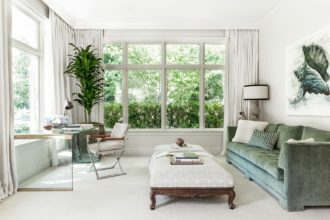 They are styled with pillows from Mary Cates and Co., Ralph Lauren, and Calypso St. Barth. The sofa from Monarch Sofas is covered in Sunbrella fabric, the pouf and throw are from Calypso St. Barth, and the ottoman is made by David Cuellar. Wood boxes from ContextVintage rest on top. The rug is from Interior Resources. This back-and-forth push from Tracy ended up being exactly what the indecisive Christy needed. “She was wonderful about giving me five ideas in five options. She would narrow it down considerably,” Christy explains. 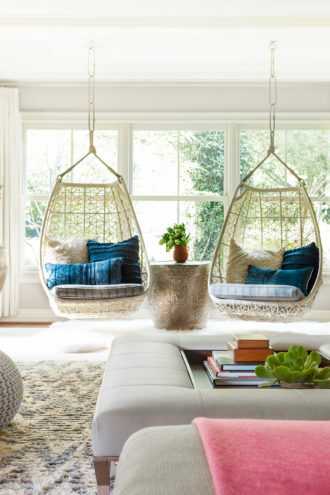 They worked together on the entry, den, living room, and dining room, making some playful additions here and there, such as Kettal swings from Smink in the den that look out to the backyard. “She brought a lot of life into our house,” she says. However, a few sentimental pieces remained, such as a dining room armoire Christy found on a work trip to France—the first piece of furniture she ever purchased—as well as her art collection, which includes works by her mother, Jackie Goode Briscoe. “I feel really lucky that we have always had art in our home because my mom has been generous to paint us whatever we want,” she explains. 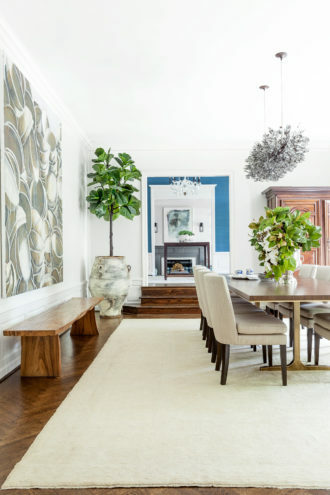 To showcase their collection, Christy and Adam set up a rotating artspace in their breakfast nook—a spot where they and their two children, ages 14 and 16, gather to eat dinner five nights a week. The sitting room off the master suite also doubles as a workspace for Adam. A seashell painting by Christy's mother, Jackie Goode Briscoe, offers a colorful accent to the neutral drapery from Restoration Hardware and the vintage ottoman. A vintage chair sits at a custom Neovations desk. 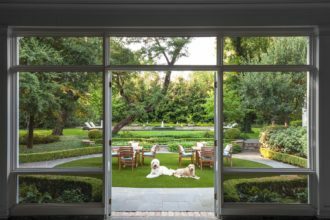 The family dogs, Madeline and Brinkley, relax in the backyard, which was landscaped by Naud Burnett of Kevin Clark | Naud Burnett. Don’t be afraid. Just say yes. Don’t feel like you’re married to a certain style or interior option—have fun with wallpaper or color. “I felt frozen to make a decision, thinking, ‘You can’t change it once you’ve done it.’ [Designer Tracy Hardenburg] talked me out of that way of thinking—that mind-set was really juvenile. If you don’t like it in five years, rip it down,” Christy says. Keep it close. Real close. Christy recommends keeping your refrigerator, cooktop, and sink in a tight 15-foot working triangle. If your kitchen is larger scale, add a refrigerator drawer in the triangle with your necessities like milk, butter, and eggs. Take two of everything! Think about the functionality of the kitchen first. “We’ve been doing a lot of double sinks—two separate sinks side by side—so two family members can clean. It makes entertaining fun and easy,” she says. Look Up! Don’t forget the ceiling. Christy recommends designing at least one room with 8-foot ceilings. “I try to have at least one room that has a low ceiling, because I feel like everybody needs their cave or warm and fuzzy, comfortable space,” she explains. If your entire house has low ceilings, adding architectural elements to the ceiling will draw your eye up, making the space feel taller than it is. Add a little on the side. Don’t forget about the side yards. “There’s a lot of opportunity to do wonderful things in the side yard—vegetable gardens, a putt-putt golf course, or a bocce court,” Christy says. Try this cool solution. “The closer you put your pool to your home, I think, the better. It’s so hot here that if you can get a view of water from your house, you can pull your pool in so that you have a relationship with it. It can expand your yard and your interior,” she says.